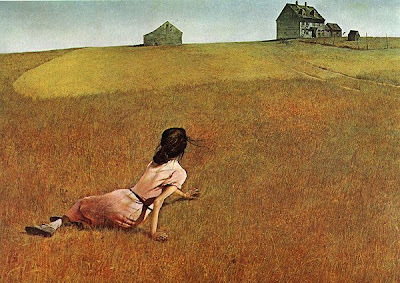 For some, Andrew Wyeth is a mere purveyor of trite Americana, of kitsch, of illustrative, sentimental pap. Okay, he's no Rothko. He was not abstract. However, as the painting above shows, Mr. Wyeth was one of the finest American painters of a gothic-realist school, that managed to convey the uncanny aspects of the natural world once peopled, in a manner that is both classic and strange. Wyeth, whose work I love and so do not resist, is the Robert Frost of painting, with all the sins and positives that suggests. Then again, I grew up near the countryside, and spent much time on farms and in woods, as a boy. I knew such people, with their weathered faces. I saw those homes, those fields. As David Lynch (an unexpected cornpone-weirdo follower perhaps) proves, there is much power and artistry in mining the odd surface of everyday rural and small-town America. "Okay, he's no Rothko." No, thanks be to God/Nothingness, though I like Rothko very much. In fact I love many abstract and abstract expressionist paintings, by Howard Hodgkin, Pollock, Mondrian, Jasper Johns etc. But I believe that figurative painting tests the skill of a painter in far more interesting ways. Your comparison with Frost seems apt. Milosz once said something to the effect that perhaps abstract painting is all we deserve. I disagree.